Rediff.com » Movies » Happy Birthday, Lataji. And thank you! Happy Birthday, Lataji. And thank you! Imagine Hindi cinema without Lata Mangeshkar? Actually, you can’t. And thank heavens for that. As Lata Mangeshkar turns 85 on September 28, Raja Sen pays rich tribute to doyenne of the film industry. Imagine, for a few alarming minutes, Indian cinema without Lata Mangeshkar. The thought is a morbid, immediately frightening one, evoking instant mental images of heroines left voiceless and iconic songs remaining unsung, of great cinematic moments shorn of their delicacy and of immortal duets turned into one-man laments. The truth, of course, would be nowhere near that nightmare. Other singers and other voices would invariably have stepped up and sing the very same songs, make the very same heroines appear suitably coy, adequately please the very same directors and composers, amuse audiences, and even make Prime Ministers sob. Someone would have done it. Or, at least a lot of someones would have. But that happens to be a fairly disconcerting (and potentially cacophonous) scenario in itself: given the slew of singers coming in to tackle the lady’s mammoth discography, we’d have had no definitive female singer but instead a whole bunch of them. This admittedly does not sound like a bad thing but would be more like today’s playback scene -- when anyone from Rabbi to Yo Yo Honey Singh sings for the same actor -- but so few actually sound like the person lipsyncing on screen. The grand dame, on the other hand, not just sounded like her heroines, from Madhubala to Madhuri, but actually raised their performances, made their expressions stick, enhanced the narrative. Over seven decades, she’s made our films better films. India’s first talkie, 1931’s Alam Ara, released with a half-dozen songs. Twelve years later, a young Lata did her first bit of playback for a Marathi film, and she’s never looked back. Neither has Hindi film music, who, having found a gold mine, latched onto her with tenacious gusto. 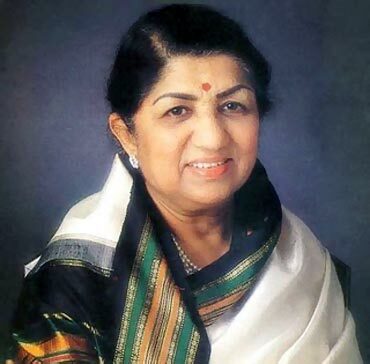 Lata prolifically working alongside the many a landmark composer across many an era, shaped the very nature of Hindi film music and defined our cinematically unique art of playback singing. The way a song must aid not impede a narrative, the way the audience should not disconnect from the characters when they break sporadically into song, the way a highly distinctive voice -- like her, or other prolific, marvellously varied artists like Kishore Kumar or Mohammad Rafi or Asha Bhosle -- could intentionally trigger off memories of different movie scenes and characters in order to better round off scenes or characters. All with literally just a rolling of the rrrrs, a purr that tied a character together. She did it more memorably and more often than any other singer in the history of... well, frankly, anything. Nobody seems to have kept truly accurate count, but she’s sung more songs than The Beatles, The Rolling Stones and any 10 other bands you can think of, put together. She has, it is claimed, been featured on well over a thousand soundtracks, which should say it all. But what the numbers don’t say is what her musical numbers did, so modestly and magically. She sang it simple, playful, devotional, earnest, romantic, philosophical, funny, wicked, seductive, sweet, maudlin: over the years she’s directed the country’s collective mood so masterfully -- and so often -- that it remains impossible to overestimate her impact on our perception of Hindi cinema as a whole. Imagine Hindi cinema without Lata Mangeshkar? Actually, you can’t. Happy Birthday, Lataji. And thank you. 85 years of you is the greatest vintage we could wish for. Send Lata Mangeshkar a postcard!